Korea's Information Society: South Korea: "the world's most advanced mobile economy"
South Korea: "the world's most advanced mobile economy"
A new report by the Boston Consulting Group confirms and quantifies what those of us living in South Korea have known for a long time. This nation is the world's most advanced mobile economy. The report singles out three countries that are reaping the greatest rewards from the mobile economy: South Korea, the U.S. and China. It notes that "South Korea has quickly become the world’s most advanced mobile economy, having embraced 3G and 4G since their onset. Mobile represents 11 percent of the country’s GDP, valued at $143 billion. South Korea is a leading actor across all phases of the mobile value chain, particularly in its high-value segments such as design and production of devices and components. A strong focus on R&D and bold investments in nascent technologies, such as semiconductors in the 1980s and Code Division Multiple Access (CDMA) two decades later, helped South Korean players take the lead in design and manufacturing operations." As shown in Exhibit 4 from the report (click to see a full size version of the graphic), the six countries analyzed have a combined mobile GDP (mGDP) of more than $1.2 trillion and those same countries account for 47 percent of global GDP. In Korea, the mGDP accounts for 11 percent of the national GDP. 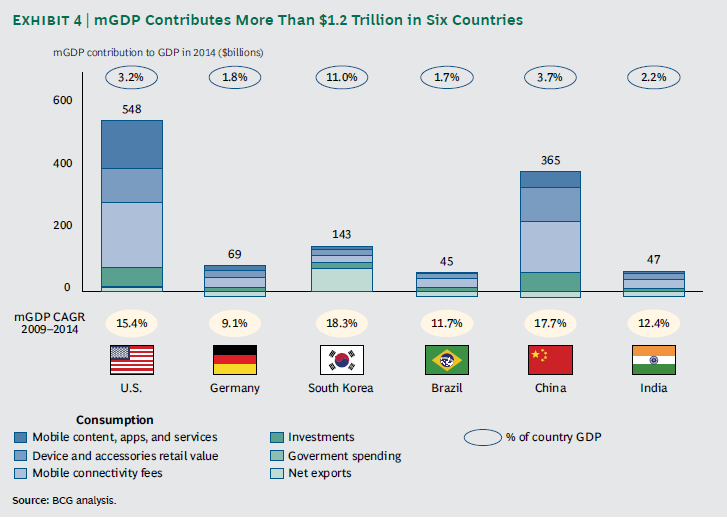 Also, as noted in the report and shown clearly in the graphic (light green shading on the bar for Korea) "For nations with high production relative to domestic consumption, such as South Korea, exports are a major, if not the main, driver of mGDP. Countries with the strongest mGDP also tend to have unique capabilities within the highest-value portions of the mobile industry—intellectual property (IP) innovators, device manufacturers, and component designers—enabling high net exports. South Korea’s high mGDP, for example, is due to its major role in producing and exporting essential mobile products and components." There is much more in this report and I recommend it to you.